Withdrawn, uneducated and unloved, Frederick collects butterflies and takes photographs. He is obsessed with a beautiful stranger, the art student Miranda. When he wins the pools he buys a remote Sussex house and calmly abducts Miranda, believing she will grow to love him in time. Alone and desperate, Miranda must struggle to overcome her own prejudices and contempt if she is understand her captor, and so gain her freedom. “Just those three words, said and meant. I love you. They were quite hopeless. He said it as he might have said, I have cancer. The Collector is really something. I’ve been watching a few YouTube channels recently that tend to feature mostly literary fiction and this book is one that came up more than a few times and it flew onto my wishlist. When Laura bought it for me for Christmas, I waited only as long as it took me to finish a book I’d already started before cracking it open. The story is pretty simple. Frederick is a lonely man with little in his life but his aunt and cousin and his collection of butterflies. When he wins a fortune, it occurs to him that he longer needs to limit himself to butterflies. The beautiful woman that he has admired from afar can be his. He can take her beauty and have it all to himself. So he does. The stream of consciousness style of the first part took a bit of getting used to but once I was used to it, the effect was completely unnerving. Fowles’ writing is manipulative and disorientating. I knew that I was reading the narration of a deeply disturbed man who had kidnapped a young woman just so that he could have her as part of his collection and yet I found myself completely taken in by him. His motives are perverted and his love is deeply flawed (if it can even be called love at all) but he truly believes that if he can only keep Miranda long enough and force her to get to know him, she’ll grow to love him. As Miranda wheedles and pleads and lashes out, I felt sorry for Frederick. His illusion is shattered and his despair is gut-wrenching. I felt sorry for a deluded sociopath, knowing that he was a deluded sociopath. I’ve read a lot of reviews that criticise the second half, which shows Miranda’s perspective on the events of the first. I’ll admit that it doesn’t have quite the same disconcerting quality (there’s something much less unique about feeling sorry for someone who is being held captive) but it does add a lot to the novel in a different way. It recounts some of the same events told by Frederick earlier but in doing so it throws into sharp relief just how disturbed he is. It can be repetitive and it can blur off into tangents about art and Miranda’s life before she was incarcerated in Frederick’s cellar but it’s the writings of a woman trapped underground and it fits. Where Frederick’s narrative is told in the past tense and with the benefit of hindsight, Miranda’s is told in the present tense and shifts with her moods and the events that she is writing about. And the ending! Oh, the ending. I can’t think of any way that I would change it. Absolute perfection. 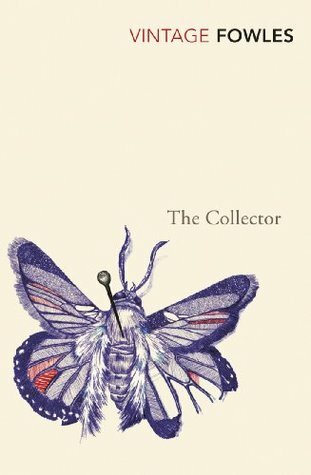 When I first finished The Collector, I gave it 4.5 stars for some nagging feeling that the section of Miranda’s writings was just a little too long. Three weeks later, though, and the book is still haunting me. I still find myself thinking about just how clever it was and how disturbing the closing paragraphs were. Any book that has that kind of effect has got to have 5 stars, really. Overall: A dark and sinister novel that is very powerful in its own quiet way. If you aren’t put off by different styles of narrative or by pitiable sociopaths, I really can’t recommend The Collector enough. It had me thoroughly creeped out and pensive while I was reading it and it’s still lingering around in the back of my mind. Just excellent. Source: Gifted for Christmas – thanks, Laura! On finishing this, I remembered that I also owned The Magus by John Fowles. Has anyone read it? Recommendations for other similarly disorientating books are welcome too! The Crimson Petal and the White: A Read-Along!